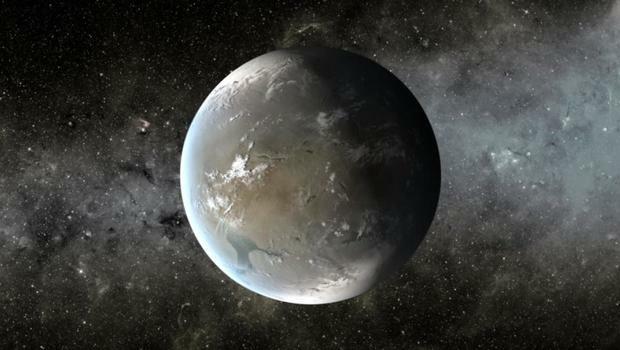 Astronomers are “99 percent confident” that this exoplanet is real and not a false detection. The planet for Barnard’s star – 2nd closest star system to our sun – appears to be a cold super-Earth. Barnard’s star – the 2nd closest star to Earth – has a large proper motion on our sky’s dome. 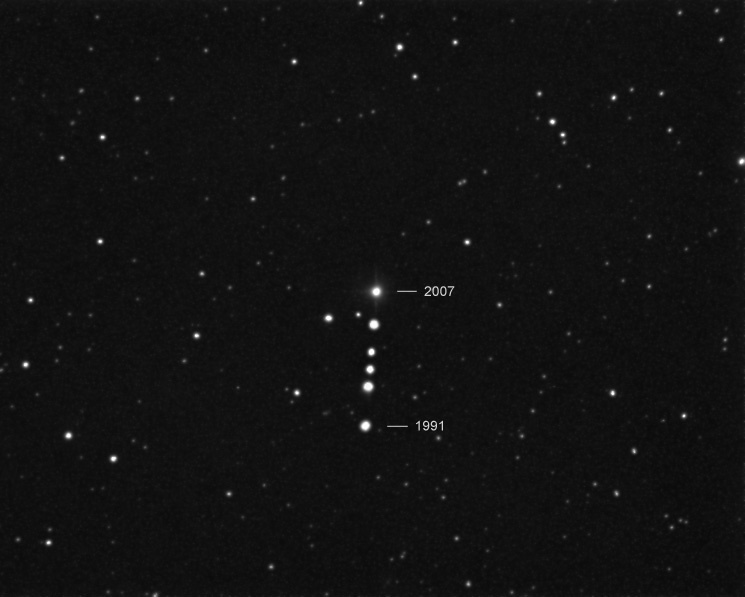 This image – via One-Minute Astronomer – shows its motion from 1991 to 2007. Now, this very nearby star is known to have a planet. Astronomers have discovered thousands of exoplanets in recent years – even an Earth-sized planet orbiting the nearest star to our sun – Proxima Centauri. 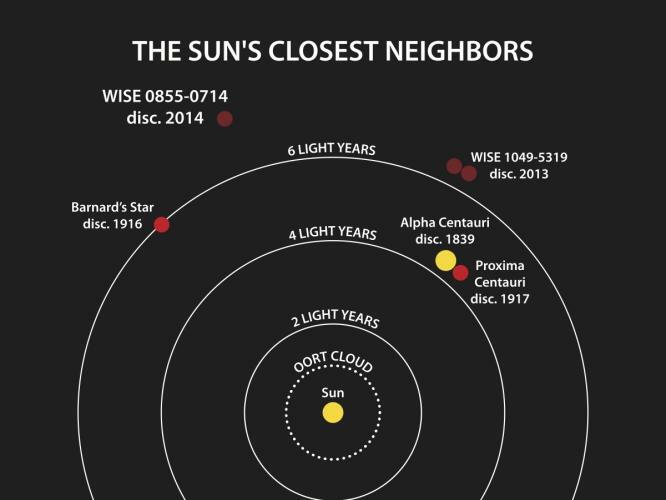 Today (November 14, 2018), they’re announcing another exciting finding, a super-Earth planet orbiting the closest single star (and second-closest star system) to our own sun at only six light-years away, Barnard’s Star. 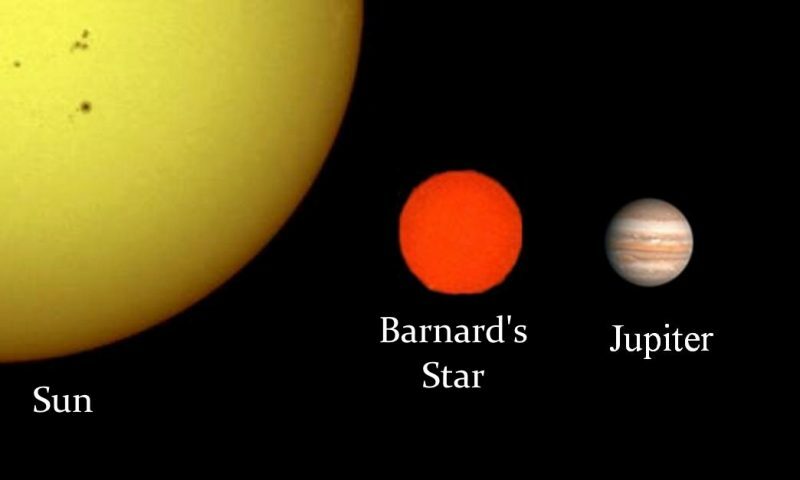 The planet has been labeled Barnard’s Star b (GJ 699 b). Its discovery has been decades in the making! Indeed, Barnard’s Star was among the first to be announced – from the early 1960s to the early 1970s – as having an orbiting planet. Astronomer Peter van de Kamp argued he saw “wobbles” in the star’s motion across our sky, indicating one or more planets tugging on the star. He was in error, with the apparent positional shifts apparently caused by adjustments in the telescope lens, but the mystique of Barnard’s Star endured. That mystique, and the nearness of this star to Earth, must have helped encourage an international team of astronomers to work hard to find a planet for Barnard’s Star. The team – including astronomers from the European Southern Observatory (ESO), the Carnegie Institution for Science and elsewhere – has published its paper announcing the discovery in the peer-reviewed journal Nature. We used observations from seven different instruments, spanning 20 years of measurements, making this one of the largest and most extensive datasets ever used for precise radial velocity studies. The combination of all data led to a total of 771 measurements – a huge amount of information! And, indeed, Barnard’s Star b is the smallest and most distant planet from its star to be found so far using radial velocity. The radial velocity technique relies on the fact that a planet’s gravity causes tiny wobbles in the orbit of its star. The technique is based on the fact that not only does the star’s gravity affect any orbiting planets, but those planets can also affect the star, albeit to a much lesser degree. This technique has been used to find hundreds of planets. We now have decades of archival data at our disposal. The precision of new measurements continues to improve, opening the doors to new parameters of space, such as super-Earth planets in cool orbits like Barnard’s Star b. After a very careful analysis, we are over 99 percent confident that the planet is there. However, we’ll continue to observe this fast-moving star to exclude possible, but improbable, natural variations of the stellar brightness which could masquerade as a planet. Barnard’s Star is a red dwarf star. It’s small; here’s its size compared to that of our sun and Jupiter, our solar system’s largest planet. Image via Wikimedia Commons. Barnard’s Star b appears to be a super-Earth – a type of exoplanet that is larger than Earth but smaller than Uranus or Neptune. It has a mass 3.2 times that of Earth and orbits its star every 233 days. At that distance, because the star is smaller and cooler than our sun – only emitting 0.4 percent of our sun’s radiant energy – the planet is colder than Earth, with an estimated surface temperature of -238 degrees Fahrenheit (-150 degrees Celsius). This makes it unlikely to be habitable, although little is known still about specific conditions on the planet. We have all worked very hard on this breakthrough. 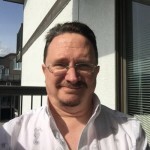 This discovery is the result of a large collaboration organized in the context of the Red Dots project, which included contributions from teams all over the world. Follow-up observations are already underway at different observatories worldwide. These astronomers also note that, since the planet is close, it will be an ideal target for NASA’s upcoming Wide Field Infrared Survey Telescope (WFIRST). It might also be possible to observe Barnard’s Star via the European Space Agency’s Gaia mission, whose second data release earlier this year has yielded a huge bounty of new and exciting insights in astronomy. 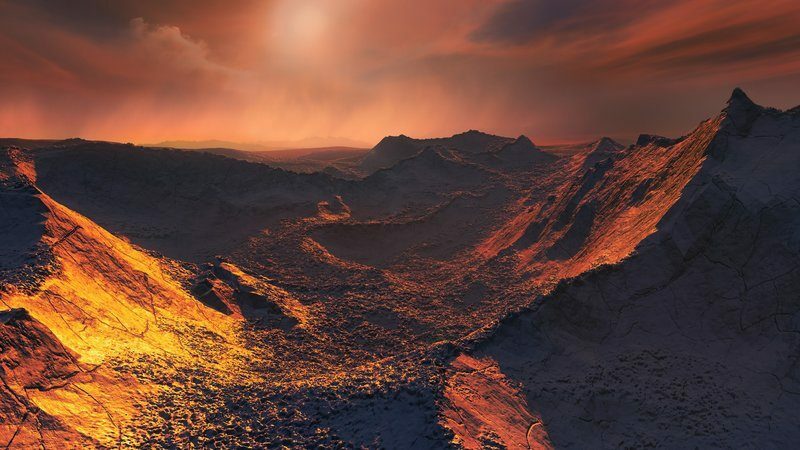 Artist’s concept of the surface of the newly discovered planet, called Barnard’s Star b. Image via ESO/M. Kornmesser. Artist’s concept of Barnard’s Star b. Image via ESO/M. Kornmesser. 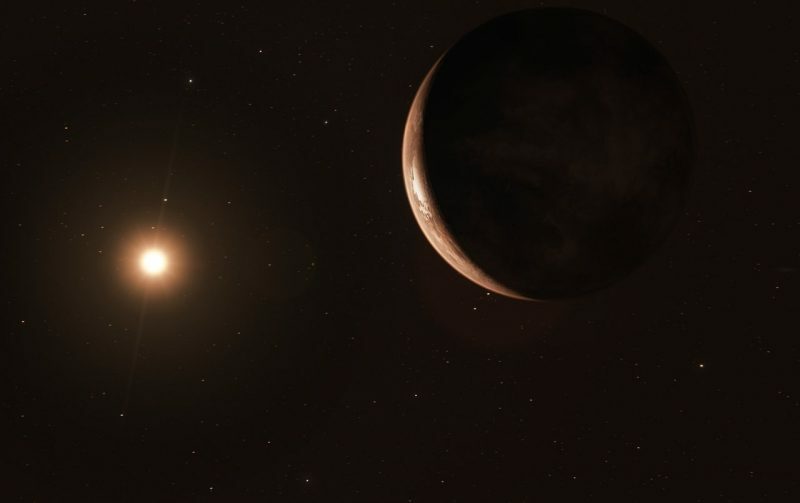 At six light-years away, Barnard’s Star is the closest single star to our sun, but fourth closest star overall, after the three stars that make up the Alpha Centauri triple-star system, which includes Proxima Centauri. It is a red dwarf star, known to produce some flaring, but less active than most other known red dwarfs in terms of stellar flare activity. Like red dwarfs generally, this star is smaller – and believed to be older – than our sun. Even though it is the second-closest star system, Barnard’s Star is too faint to be seen with the human eye. The star is named for Yerkes Observatory astronomer E. E. Barnard, who was the first to notice its large proper motion – or sideways motion on our sky’s dome – in 1916. The large proper motion of Barnard’s Star is caused in part by the star’s nearness to Earth, but also by the fact that Barnard’s Star – and its newly found planet – are merely passing through our neighborhood of space, as opposed to moving in the same general stream as our sun and other nearby stars around the galaxy’s center. Over the long course of astronomical time, Barnard’s Star will move farther away! Barnard’s Star b is a super-Earth, like Kepler-62f. This picture is an artist’s concept. Image via NASA Ames/JPL-Caltech/T. Pyle. Bottom line: The discovery of a super-Earth exoplanet so close to our solar system is exciting, even if the planet is unlikely to be habitable. The fact that many such worlds have already been found, and now this one so close by, means that they must likely be common throughout the galaxy, increasing the chances that some of them, or their Earth-sized cousins, could indeed support life.